Visible imagery from NASA's Aqua satellite revealed the effects of wind shear on Tropical Cyclone Gelena in the Southern Indian Ocean. The storm weakened to a tropical storm. 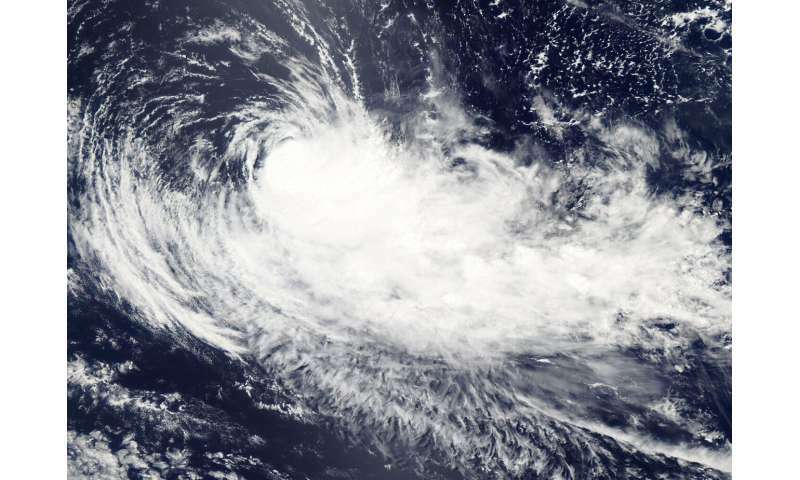 On Feb. 11, 2019, the Moderate Resolution Imaging Spectroradiometer or MODIS instrument aboard NASA's Aqua satellite captured a visible image of Tropical Cyclone Gelena. Westerly wind shear pushed the bulk of clouds and storms east of the center. Wind shear is a measure of how the speed and direction of winds change with altitude. At 10 a.m. EDT (1500 UTC) on Feb. 11, Gelena was located near 24.6 degrees south latitude and 70.3 east longitude, approximately 745 nautical miles east-southeast of Port Louis, Mauritius. Gelena was moving to the southeast. Maximum sustained winds were near 55 knots (63 mph/102 kph). Forecasters at the Joint Typhoon Warning Center expect Gelena to dissipate in three days, by February 14.